At long last, our American Sign Language Interpreters United unit has agreed tentatively to contract terms with employer Purple Communications. Our ASL interpreter sisters and brothers are holding ratification votes this week. The first one was in Oakland on Monday. Results will be announced once members in all four locations have voted. For a great background piece, check out this NewsGuild story. 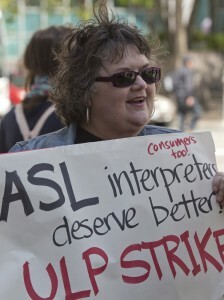 During March of 2013, employees of four Purple centers, later known as American Sign Language Interpreters United (ASLIU), began bargaining a labor agreement with Purple Communications. This came as a result of Union organizing efforts during October and November of 2012, when the four centers voted to have Communications Workers of America (CWA) represent the employees as the first ever unionized VRS interpreters. The reasons for organizing were many, but primarily they amounted to protesting multiple unilateral changes that Purple systematically imposed on its video interpreters over the years. Video interpreters found these changes to have negative impacts on their work, health, and ability to provide quality service to Purple’s customers. Prior to organizing, pleas for better change were categorically ignored. With the help of CWA and Pacific Media Workers Guild, that has changed. Bruce Meachum, ASLIU’s Chief Negotiator, and Martin Yost, ASLIU Representative, are visiting the four represented units this week to answer any questions the membership may have and run the ratification votes.